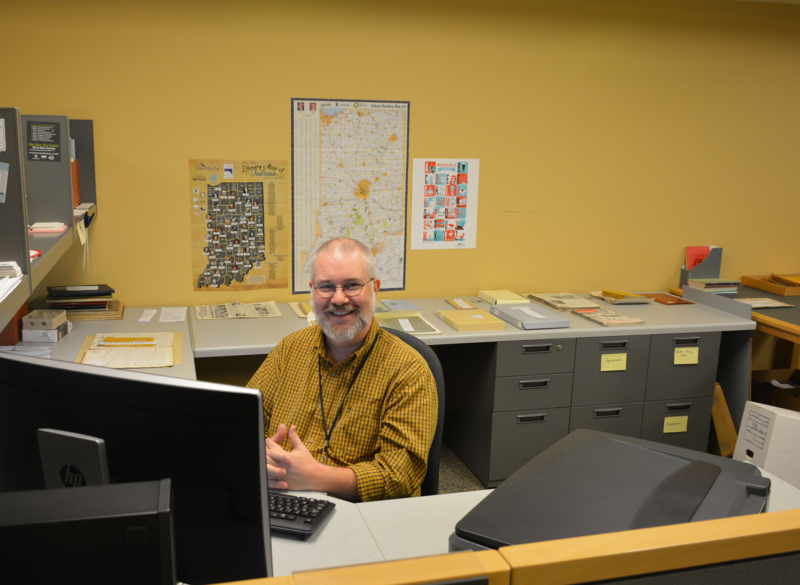 Since Jan. 30, 2017, Chris Marshall has been the digital collections coordinator for the Indiana Division at the Indiana State Library. He’s previously held positions at Conner Prairie, the Indianapolis Museum of Art, the Indiana State Museum and the Indianapolis Public Library (IndyPL). Recently, he took time to answer some questions and here are the responses. Chris Marshall, smiling and working. Describe some of your work duties? I answer reference questions, either in person or by email or chat, but the biggest part of my job is digitizing materials from the Indiana Division’s collection and building digital collections. How does this job compare to previous jobs? When I worked at the Indiana State Museum, I worked with objects in the Decorative Arts Collection. This was in the pre-digital world. I also curated a major exhibit about early 19th century furniture and architecture. This required researching and searching for furniture in the collections. This position reminds me of part of my previous job at IndyPL’s Central Library. Here, I’m focusing on the digital access of the collections by providing information and research materials to patrons all over the world. I often wonder how many people in Frankton, New Zealand might be researching something in Frankton, Indiana. I don’t really know if they are, but it amazes me that just twenty years ago, the access would have been limited and required more time and patience. I have a B.A. in American History and French from Ball State University. I have an M.A. in Museum Studies, also known as Historical Administration, from Eastern Illinois University, with an internship at the Indianapolis Museum of Art. Last but not least, I got my Master of Library Science at IUPUI/Indiana University. What sparked your interest in collections? When I was in middle school, I was a history geek. We took a trip to the Anderson Public Library and there we learned about genealogy. That sparked my interest. In hindsight, I was glad that I started working on it then because it gave me the chance to talk with the older members of my family and I learned a lot about the family. From that, I found my love of research and cultural history and learned what it was like to live during the times I was researching. I was always more interested in the social and cultural aspects of history, as opposed to political or military histories. Julia Child vs. Guy Fieri? Julia Child without a doubt! She pioneered teaching cooking and look at what that lead to. She knew who to teach and encourage and do it in such a way that made me smile and want to actually learn to de-bone a duck. No, I have not done it yet. Guy seems to be more of the celebrity chef. Julia was humble in her work and career. If I’m not writing or working on my books that I have yet to find an agent for, I’m being crafty. During my Conner Prairie days, I learned to knit, so I have a lot of yarn stashed away for future projects. I usually knit while catching up on movies that I didn’t see at the theater or while binge-watching television shows like “Grace and Frankie” or “The Twilight Zone” or “The Simpsons.” Gotta get back to “The Walking Dead;” not my favorite, but it grabbed my attention. I’ve also learned simple bookbinding. The books I’ve written range from a middle-grade time-traveling trilogy to a haunted hotel in upstate New York to a secret love affair. Some are complete and some are in the works. I also maintain a blog with some of my short stories and miscellaneous posts about my observations on life. I am also a Lego maniac and I’m working on a series of blog posts using my Lego sets. My favorite books are ones set in museums. I’m currently reading “Relic.” I re-read “From the Mixed-Up Files of Mrs. Basil E. Frankweiler,” but I definitely prefer the 1970s movie version over the book. What do you hope to gain from your experience here at the state library? To learn more about Indiana history. My goal as the Digital Collections coordinator is to have a least one digitized item from each county of the state in the digital collection. So far, so good on that one. I also hope that this might lead to a high-level position; maybe manage a whole digital department somewhere someday.